Isn’t there anything this Superpope can’t do. Next year the Pope will decree that mother Earth is being destroyed by the ever increasing emissions spewed forth by the evil human race. Pope Francis is looking to achieve a feat that has eluded secular powers and will try to inspire decisive action on climate change. According to Bishop Marcelo Sorondo, chancellor of the Vatican’s Pontifical Academy of Sciences: the pope’s wish to directly influence next year’s crucial UN climate meeting in Paris, when countries will try to conclude 20 years of fraught negotiations with a universal commitment to reduce emissions.“Our academics supported the pope’s initiative to influence next year’s crucial decisions,” Sorondo told Cafod, the Catholic development agency, at a meeting in London. “The idea is to convene a meeting with leaders of the main religions to make all people aware of the state of our climate and the tragedy of social exclusion.” Why then would the Pope make a dramatic claim that mother Gaia needs to have emissions reduced. Its quite simple, its all about the money. Pope Francis has been pushing for this environmental worship for quite some time. It’s all about the money and the world superpowers will line up to redistribute the wealth to the poor. This is a form of climate socialism from the False Prophet that will take away from those who work tirelessly. According to The Guardian: In recent months, the pope has argued for a radical new financial and economic system to avoid human inequality and ecological devastation. In October he told a meeting of Latin American and Asian landless peasants and other social movements: “An economic system centred on the god of money needs to plunder nature to sustain the frenetic rhythm of consumption that is inherent to it.“The system continues unchanged, since what dominates are the dynamics of an economy and a finance that are lacking in ethics. It is no longer man who commands, but money. Cash commands.“The monopolising of lands, deforestation, the appropriation of water, inadequate agro-toxics are some of the evils that tear man from the land of his birth. Climate change, the loss of biodiversity and deforestation are already showing their devastating effects in the great cataclysms we witness,” he said. According to Neil Thorns, head of advocacy at Cafod, said: “The anticipation around Pope Francis’s forthcoming encyclical is unprecedented. We have seen thousands of our supporters commit to making sure their MPs know climate change is affecting the poorest communities.” A new economic system will rise out of this beastly agreement. It will monopolize the current system of the world’s economy and unite it all as one. Climate Change is being used to usher in this new system. What’s even more disturbing is how the kings of the nations are lining up to do business with the Vatican. It almost as if she is fulfilling biblical prophecy concerning Babylon. “And the kings of the earth, who have committed fornication and lived deliciously with her, shall bewail her, and lament for her, when they shall see the smoke of her burning, Standing afar off for the fear of her torment, saying, Alas, alas, that great city Babylon, that mighty city! for in one hour is thy judgment come.” Revelation 18:9,10. Rome is now doubt the religious scarlet woman who rides the beast in Revelations. “And the woman which thou sawest is that great city, which reigneth over the kings of the earth.” Revelation 17:18. The end game is nearing upon the world. A false prophet is rising upon the scene and the inhabitants of planet earth are failing to see the warning signs. Kings are committing fornication with her and a new world order religion will be ushered in. A time of distress is coming and a beast which looks like a lamb, but speaks as a dragon is turning the christian world upside down with doctrines that twist the word of God. Pope Francis is at it again concerning Biblical matters of the Christian faith and the Bible. This time concerning the creation account from God. The theories of evolution and the Big Bang are real and God is not “a magician with a magic wand”, Pope Francis has declared. Remember not too long ago he stated that having a Personal relationship with Jesus was dangerous. He has now regulated Christians as believers to a magician in the sky. “When we read about Creation in Genesis, we run the risk of imagining God was a magician, with a magic wand able to do everything. But that is not so,” Francis said. “The Big Bang, which today we hold to be the origin of the world, does not contradict the intervention of the divine creator but, rather, requires it. I guess Christians are into magic now. How can Pope Francis be so ignorant of the Bible? The two models he is espousing contradict each other. If you don’t believe me than why don’t we take a few quotes from some Atheists who have regulated God as the magic man in the sky. [N]o astronomers would ever think of the big bang as the creation event of Genesis. The big bang was invented specifically for the purpose of doing away with the creation event. An astronomer would laugh at the naivety of anyone who chose to equate the two events- Paul Steidl. What Paul is basically saying here that Pope Francis is naïve and is silently being mocked for believing that the two ideas are compatible? Here are just some of the contradictions between the two. Psalm 19:1-6 1 The heavens declare the glory of God; the skies proclaim the work of his hands. 2 Day after day they pour forth speech night after night they reveal knowledge 3 They have no speech, they use no words no sound is heard from them. 4 Yet their voice[b] goes out into all the earth, their words to the ends of the world. In the heavens God has pitched a tent for the sun. 5. It is like a bridegroom coming out of his chamber, like a champion rejoicing to run his course. 6 It rises at one end of the heavens and makes its circuit to the other; nothing is deprived of its warmth. Yes, all of creation utter forth speech to declare a creator and his great glory. No ignorant Vicar of Christ can take that away from him no matter how fallible Pope Francis may be. This theistic evolutionist has turned the creation into the creator and has blurred the lines of his faith and those who cling onto his every word. We must stand firm by the Biblical account to these so called men of God who try to destroy it. Stand firm Christian brothers and sisters of faith. Defend his word for the time is drawing near and the great falling away has begun! A Catholic Astronomer by the name of Brother Guy Consolmagno says that those who believe in a young earth have “bad theology” and is borderline ” blasphemous theology”. There are those who believe in a young earth creation. Some believe that the Earth is about 6000 years old. We have 5000 year of recorded history. Before the scientific community decided to take over and label the universe in the billion of years, alot of believers assumed the earth was young. I am not here to debate how young the earth is, but I am here writing that the word of God is important. Regardless of how old the Earth is ,creation by God is the absolute truth. Evolution seeks to take the image of man away from God and triumphantly declare fact that we came from a mutated breed of simaen apes who learn to walk, tall, and eventually become the people we are today. God says HE created man in his image. Science declare there was no God for human creation. Someone is obviously lying and I like to believe it isnt God. What good Brother Guy is basically saying is that he doesn’t believe in the Genesis account of creation because “the Bible should not be used as a basis for scientific study.” This is the same man that believes in Aliens and would baptize them if they asked to be baptized. Sounds like he believes in a different creator. Don’t underestimate the deception and continue reckless attack on the absolute truth of the Bible and creation. Its sad that a catholic priest has decided to basically attack the Genesis account . He rather believe a lie than the creator himself. Brother guy believes that “Science is a way of getting close to creation, to really getting intimate with creation, and it’s a way of getting intimate with the creator. “It’s an act of worship.” This act of worship is beginning to deny the very essence of God’s creation and Brother Guy is borderline denying that same creator. This is the dangerous idea where the creature is worshiped more than the creator. It is called evolution and brother Guy is worshupping this idea whether he knows it or not. Romans 1:25 Who changed the truth of God into a lie, and worshipped and served the creature more than the Creator, who is blessed for ever. Amen. BRISBANE TIMES: Science and religion have often appeared at loggerheads, but Papal astronomer Brother Guy Consolmagno says there is no need for conflict. Brother Consolmagno said while literal readings of the Bible suggested the world was young, the perpetration of that belief, despite the scientific evidence to the contrary, was simply “bad theology”. “It’s almost blasphemous theology,” he told Fairfax Media during a visit to Brisbane on Wednesday. This was Orginally posted on http://thesechristiantimes.com/ Dont forget to visit my new website and see what other interesting news articles I have put up. Read Opinions from myself and other Bloggers on Current events and Faith. God Bless you. 2 Timothy 4:2-3, Preach the word; be instant in season, out of season; reprove, rebuke, exhort with all longsuffering and doctrine. 3.For the time will come when they will not endure sound doctrine; but after their own lusts shall they heap to themselves teachers, having itching ears. In yet, another baffling comment by the so called Vicar of Christ (earthly representative of God or Christ), in an interview published in part of Argentine weekly “Viva” July 27. Pope Francis was asked to reveal 10 secrets to happiness. One of the item that he lists should be heavily scrutinized since he believes that Christians should not evangelize. Some Odd Happenings Surrounding Pope Francis. Is he the False Prophet of Revelations? Here are other meanings for “proselytize” – evangelize, convert, save, redeem, win over, act as a missionary, advocate. Contrary to what Pope Francis says, it is written in the Bible to go and evangelize. Matthew Chapter 28 19-20, Go ye therefore, and teach all nations, baptizing them in the name of the Father, and of the Son, and of the Holy Ghost. 20 Teaching them to observe all things whatsoever I have commanded you: and, lo, I am with you alway, [even] unto the end of the world. Amen. I understand we need to respect other religions and there is nothing wrong with that. Sometimes as a Christian we need to understand the battlefield before us. Being pushy has never won a convert. Following in the example of Christ has. This just totally boggles the mind that Pope Francis would even utter such blasphemous ideas. My fellow Christians the time has come for you to open your Bible and read the word of God. An Apostasy of the Christian faith has taken root and it seeks to wipe out the absolute truth and the word of God. We must rebuke, reprove, and exhort those who wish to destroy sound doctrine. The Pope who claims to represent Christ here on Earth continues to twist scripture, while feeding the masses with words that their itching ears are willing to hear. There is no grey area. Jesus is the truth, the way, and the life. This is the truth that must be spoken for those that walk in darkness. It is a duty that carries serious consequences to those that know the truth, but refuse to speak it. The time has come to put on the armor of God. Those who understand the word of God are called to be watchmen. The world is slipping into chaos and a false prophet has risen to bring a false doctrine unto the world. We must stand our ground on God’s doctrine before the flame of truth gets extinguish. Ephesians Chapter 6:10-18, 10 Finally, my brethren, be strong in the Lord, and in the power of his might. 11 Put on the whole armour of God, that ye may be able to stand against the wiles of the devil. 12 For we wrestle not against flesh and blood, but against principalities, against powers, against the rulers of the darkness of this world, against spiritual wickedness in high [places]. 13 Wherefore take unto you the whole armour of God, that ye may be able to withstand in the evil day, and having done all, to stand. 14 Stand therefore, having your loins girt about with truth, and having on the breastplate of righteousness; 15 And your feet shod with the preparation of the gospel of peace; 16 Above all, taking the shield of faith, wherewith ye shall be able to quench all the fiery darts of the wicked. 17 And take the helmet of salvation, and the sword of the Spirit, which is the word of God: 18 Praying always with all prayer and supplication in the Spirit, and watching thereunto with all perseverance and supplication for all saints. Pope Francis Says Having A Personal Relationship With Jesus Is Dangerous: False Prophet Utters False Words. Dont forget to visit my new website and see what interesting news I have posted. If you go to google search you can connect to the website there or click on your search bar and type Thesechristiantimes.com. Thank you for all your support and God Bless You. I am working on trying to get my blog connected to my website or just click on link http://thesechristiantimes.com/ Please be patient as we move in a new direction. SCROLL DOWN FOR NEWS LINK AND VIDEOS: Some “think they can have a personal, direct, immediate relationship with Jesus Christ outside of the communion and the mediation of the Church. Such temptations are dangerous and harmful. They are, in the words of the great Pope Paul VI, absurd dichotomies.”- Pope Francis. Is what Pope Francis saying true? Does having a personal relationship with Jesus dangerous? Let’s read from the Book of Revelation, what happens if you create a personal relationship with Jesus. Revelation 3:20 – Behold, I stand at the door, and knock: if any man hear my voice, and open the door, I will come in to him, and will sup with him, and he with me. Does that sound like a dangerous personal relationship to you? How dangerous is this relationship with Jesus? Well when you Abide in Jesus and his words what you ask him in prayer he will deliver. “IF YOU ABIDE IN ME, AND MY WORDS ABIDE IN YOU, you will ask what you desire, and it shall be done for you. By this My Father is glorified, that you bear much fruit; so you will be My disciples.” (John 15:7). Please read your Bible. Find within the pages of the good book what God wants of you and not man. There is nothing dangerous about creating a relationship with Jesus. On the contrary he asks you to come to him so that he can ABIDE IN YOU. Don’t be left out by man’s error, but ABIDE in the one that was nailed at the cross for you. CATHOLIC NEWS: Christians are not made in a laboratory, but in a community called the church, Pope Francis said. At his weekly general audience June 25, Pope Francis continued his series of audience talks about the church, telling an estimated 33,000 people that there is no such thing as “do-it-yourself” Christians or “free agents” when it comes to faith. 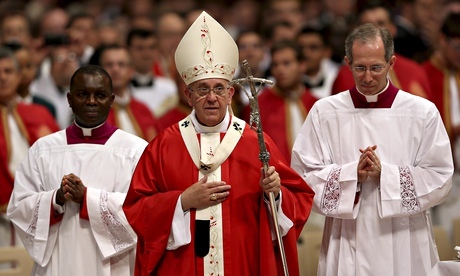 Pope To Allow Islamic Prayers To Be Held At The Vatican: Moving The World To A One World Religion. Pope Francis will let Islamic Prayer and readings from the Quran to be heard Sunday at the Vatican. This Islamic religion that claims to be peaceful also claims that we worship the same God. I have heard from many Muslims mouth here in America that we worship the same God. The middle east and around the other Islamic countries claims otherwise. There is no God, but Allah! Those who are still awake hear about the atrocities committed by this peaceful religion in places like Egypt, Syria, and Sudan. These places have open door policies that let you convert to Islam and renounce your Christian faith or die. How nice to hear such a sweet offer from such a peaceful religion. I find this amazing that are so called Christian leader Pope Francis ( the one who claims he represents Jesus Christ here on Earth) will let Islamic Prayer echo through the halls of the Vatican as an asteroid labeled “The Beast” whizzes by. Now I don’t believe that some catastrophic event will happen, but it was weird to hear about this at the same time Pope Francis was making headlines. Call me cold hearted and insensitive but do we really worship the same God. The Quran denies the trinity: Sura 5:72-73, 5:75 “They do blaspheme who say: “God is Christ the son of Mary.” They do blaspheme who say: God is one of three in a trinity: for there is no God except one God Allah. If they do not desist from their word of blasphemy, verily a grievous penalty will befall the blasphemers among them. Christ the son of Mary was no more than a Messenger; many were the Messengers that passed away before him.” Sura 4:169 “Believe in God and his apostles and say not three..” That’s funny our Bible teaches there are three and the same: Matthew 28:19 – Go ye therefore, and teach all nations, baptizing them in the name of the Father, and of the Son, and of the Holy Ghost. 1 John 5:7 – 5:8 For there are three that bear record in heaven, the Father, the Word, and the Holy Ghost: and these three are one. 8 And there are three that bear witness in earth, the Spirit, and the water, and the blood: and these three agree in one. Islam also believes that Jesus is not God and denies that he is. “In blasphemy indeed are those that say that God is Christ the son of Mary” (Sura 5:17). The Bible claims otherwise on who Jesus Christ is. John 10:30 – I and [my] Father are one. So when you hear Muslims claim that we worship the same God, than tell them that is great news so why don’t we talk about converting you to a Christian? You will see how fast their tunes changes on that belief. Time is running out. I truly believe that an accelerated process of prophecy has begun. A false prophet has risen and he is keeping a seat warm at the Tomb of Kind David. He seeks to unite all denominations under one house. The false prophet calls for religious peace. He seeks to bring understanding and acceptance with one another. Read your Bible so that you are not left in darkness. It is your guide to what is approaching and what happening in current events. [ Surah 8.12] When your Lord revealed to the angels: I am with you, therefore make firm those who believe. I will cast terror into the hearts of those who disbelieve. Therefore strike off their heads and strike off every fingertip of them. ENGLISHALARABIYA. NET: For the first time in history, Islamic prayers and readings from the Quran will be heard at the Vatican on Sunday, in a move by Pope Francis to usher in peace between Israelis and Palestinians.